Ogunquit, Maine. Near the Marginal Way. Beneath a full moon, Michelangelo and the Regenta do a little skinny dipping. Mikey, observing the Regenta's naked body, begins considering what kind of a chance he has with an alien princess. He sees her trying to pry open a lobster trap and his sense of justice overpowers his arousal. Mikey grabs her hand, stopping her, and the Regenta becomes furious. When they surface, she slaps him for touching a member of the Styraccodon royal family and insists that she’ll require a new guide from the Utroms. After she’s done, Mikey informs her that lobsters in traps are property of the trappers and that she would be breaking the law if she took one. Flustered, the Regenta swims away in anger and embarrassment… right into a fishing net. As she begins to drown, Mikey tries to get her loose. At Foot HQ, Foot Med-Tech Hiroshi applies a bio-epoxy to Leonardo’s wounded shell. Apparently, the Foot have been collecting DNA samples from the Turtles for years and that genetic info has allowed them to create ideal recuperating formulas (among other things that are Top Secret). Disturbed but not surprised, Leo suggests they begin interrogating the mystery warrior. Bound in a chair, the warrior identifies himself as Three Moon Jaguar, a warrior of the Pyr. He has come to prevent the “sowing of the five dooms” which Karai has begun by meddling with the power of some sort of book. Karai prevents the warrior from speaking more about any books, much to Leonardo’s interest. She then orders his execution and, wanting to die honorably, Three Moon Jaguar wills himself to commit seppuku by inducing a coronary infarction. Leo asks Karai what Three Moon Jaguar meant about “the book”, but the rather rattled Karai insists she knows nothing of the subject. Leo doesn’t believe her and decides to head back to the lair to do some research. Down in the sewers, the mutated Raphael and Leatherhead are slugging it out. Their brawl takes them down several tunnels and they eventually both submerge in a pool. Leatherhead swims away and Raph emerges, but so worn out he collapses into unconsciousness. 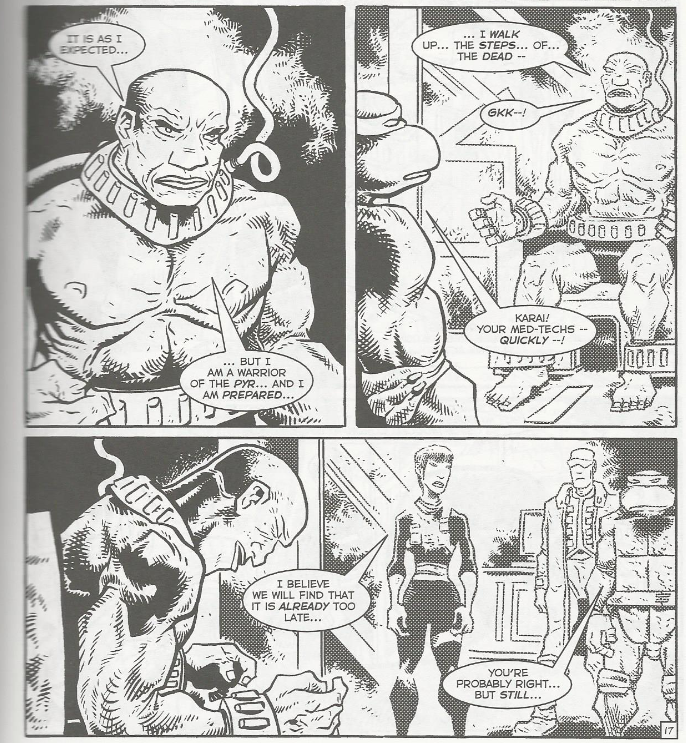 In the shrunken habitat, Donatello kills time with the explorers by telling them about his many adventures and how the world has changed since they vanished. He also postulates a connection between the lost Utroms, the mutagenic ooze they were carrying and the wood creatures that speak in an archaic Utrom dialect. They decide it’s more pertinent to think of a way out of the habitat the wood creatures have trapped them in and Don figures they could use the Utrom exo-suit of his partner to form a powerful cutting tool of some kind. Suddenly, their cave is attacked by a “giant” tarantula. Don makes short work of the creature while referencing movies that were contemporary to the early 2000s (“Spider-Man” and “Eight Legged Freaks”). After that’s taken care of, one of the “giant” wood creatures approaches the glass wall of the habitat and activates a device that shrinks him to roughly their size. He then uses a strange gun to open a door in the glass wall and steps inside. *This story is continued from TMNT (Vol. 4) #16. The story continues in TMNT (Vol. 4) #18. *Donatello mentions his encounter with the Rat King from Tales of the TMNT (Vol. 1) #4. He also mentions the Shredder, whom he killed in TMNT (Vol. 1) #1. *This issue was originally published with a bonus pin-up by Dave White. Funny. While most of Volume 4 blurs together in the recesses of my memory, I actually recall this single issue astonishingly well. I mentioned it last review, but I thought the Gameraph vs. Leatherhead fight was a Big Deal when this issue first hit the stands. So it’s one of those single moments in the volume that’s forever etched into my brain. Maybe it lives up to my recollections and maybe it doesn’t, but it was really exciting at the time. Before I get to Raph, though, I’ll talk about the Turtles in sequence. Mikey and (the) Regenta are still flirting. I know it seems pretty dull, but of all the storylines to string along, this was probably the one Laird had the most justification to stretch. Romances take time, so Mikey and Regenta can’t go from “zero” to “in love” between two issues. Now, in the timeframe of the narrative, they’re hooking up in basically a single day (keep in mind that all these issues since TMNT #13 have occurred in maybe a day or two and it’ll continue like this for a while), but for those of us reading it’s been almost half a year. Mikey’s inner monologue is some Claremont-tier purple stuff, “Oh woe is me! Who am I, a mere commoner, to fall in love with a princess? Now in case anyone didn’t get the point, I shall reword my statement six more times.” But whatever. The dialogue has never been Volume 4’s strong point. And I did love that look of resignation on Mikey’s face as he suffers Regenta’s yammering. Leo’s arc is moving along. It doesn’t really tell us anything plot-wise we don’t already know, though. We knew that Three Moon Jaguar was attacking Foot Clan printing presses that were releasing some sort of book, so the big mystery about the book Karai doesn’t want Leo to know about, and Jaguar’s hatred of it, isn’t much of a mystery for us. But hey, at least we got a bunch of proper nouns out of the deal. Now I don’t have to refer to Three Moon Jaguar as “the mystery warrior” anymore (not that “Three Moon Jaguar” is any less unwieldy). There’s also that plot germ about the Foot collecting the TMNT’s DNA and using it to make genetic matches for their anatomy. It seems to intimate cloning, like maybe the Foot have designs on creating evil duplicates of the Ninja Turtles. While thus far nothing's come of it, TMNT (Vol. 4) #32 makes a passing reference to an incident involving “the doppelgangers” and it’s cited as an Untold Tale of the TMNT. Could the Foot Clan's DNA replicating have anything to do with the doppelganger incident? We may never know. But the only reason I’m bringing it up now is because by the time I get to TMNT #32 I’ll probably have forgotten about it entirely. And now we get to the big fight between Gameraph and Leatherhead! Oh boy this is gonna be so coo- Oh. It’s over. Well, it’s actually a pretty lengthy duel, spanning 8 pages, but being done in total silence means there isn’t anything to read across those pages, so it flies by. While it isn’t as well laid out as Leo’s fight with Three Moon Jaguar from last issue and mostly comes down to a bunch of punching and tackling, I think it held up pretty well against my exaggerated memory. On a storytelling level, it isn’t entirely pointless, either. Leatherhead’s deal has always been that he’s a sort of Jekyll and Hyde (or Banner and Hulk) monster, constantly mood-swinging between intelligent and bestial. Now Raph is heading down that road and the presence of Leatherhead illustrates the point subliminally to the audience. Or maybe it was just a big dumb fight. I dunno. Donnie’s arc continues to be the least interesting. It opens with him spending a page and a half making obvious conclusions (“Could the lost Utroms, the mutagen, the rain forest and the mutant forest creatures that speak Utromese somehow BE CONNECTED!? !”) before dissolving into a pointless battle with a giant tarantula. The tarantula battle eats up 4 pages and Donnie’s banter is pretty obnoxious all throughout. I think I’ll take the growls and snarls of the Gameraph/Leatherhead fight over Donnie dropping references to early 2000s comedy films nobody wants to remember. Another uneven mix, but that’s Volume 4. While not all the arcs are so great, I do find myself rediscovering interest in the ones I DO like. You just have to take the good with the bad; the Foot Clan intrigue with the pointless giant spiders. I suppose that's true. When reading To Kill a Mockingbird, I often find myself thinking, "This is good, but it would be better with a giant spider." Maybe it can be the next book in line with "Pride, Prejudice, and Zombies" and "Sense and Sensibility and Sea Monsters"... "To Kill a Mockingbird (And Avoid Giant Spiders)"
I'll gladly take giant spiders over zombies, any day. Where are zombies so popular, these days, anyway? Oh, can we make Boo Radley into a giant spider, if we're going on this analogy? 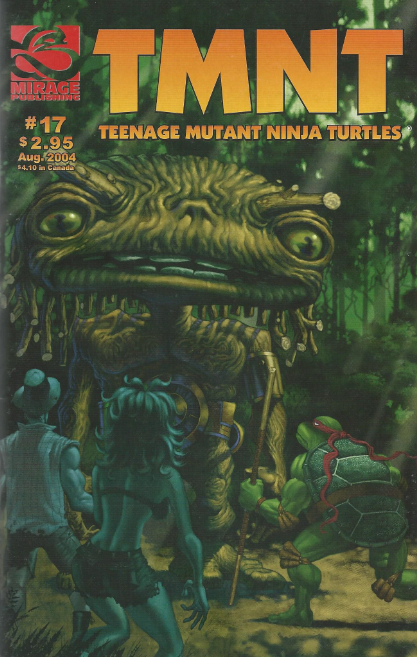 I missed the part of the Foot wanting to clone the Turtles when I re-read Volume 4, some time ago. Actually, that would have been the perfect way to introduce Slash, if Mirage was the slightest bit interested in that. Although, that one fan comic we got from Jeremiah D. Allan, I've no complaints. As for Mike/Regenta, if only Mike knew what would happen to him, as was it really worth thrown in an alien prison and lost in space for her? Of all the plot threads in Volume 4, that one -- and, yes, the April origin thing -- stuck in my craw most. And depressing, as Mike is the only Turtle who probably could maintain a long romantic relationship or would be the least dysfunctional at it (vs. Raph's anger, Leo's obsessive side and..., wait, did Don have any romantic anything happen in Mirage, I forget). Maybe Don, if he could find someone who likes his nerdiness, as otherwise, it would make no sense. Could "the doppelgangers" probably be a reference to the Shredder clones...? And romances can most certainly occur in a day or two. Though they may be 'front heavy' and hardly very long-lasting, it would make sense in this timespan. You fall head over heels in love with an alien princess before coming to the conclusion it'll never last. No matter how hard you try to make it work. ^ Are you trying to tell us your life story? Seriously though, I could understand the instant romance bit if Mike met Regenta or Seri or whomever where he was in his teens, then comes the infatuation equals true forever love. It's a little harder to swallow when he's in his 30's and ought to know better. Then again, he couldn't pass her up, could he? I assume the fate of the eggs they made would be addressed in another Untold Tale? Or where they addressed at some point in-series, as I honestly forgot?